Culinary experiences can be the highlight of any trip and one of the best ways to try local food is to eat it as locals do – on the street! From banh mi in Vietnam to crêpes in Paris and Mexican tacos, the world is full of amazing flavours which you can sample for next to nothing on any street corner. See our roundup of the top 20 street foods you simply must try on your next overseas trip. Many people are scared of trying street food for fear of being hit with “Bali belly” or similar. Although it is good to be careful, don’t let this deter you from such amazing experiences. Ask locals for recommendations or simply notice where they are queuing, always a good sign. In any doubt, prefer dishes cooked in front of you and avoid chicken and fish. Thailand’s street food is legendary, and pad thai is probably the most legendary of all. Pad thai is a stir-fried noodle dish made from rice noodles, vegetables, peanuts, fried shallots and sometimes either chicken or shrimp. Order one at a small street stall throughout Bangkok and beyond, which will be cooked fresh right in front of you. A chicken or mutton based dish of a slightly misleading name, bunny chow is thick meat curry served in a hollowed-out loaf (or half loaf) of bread. 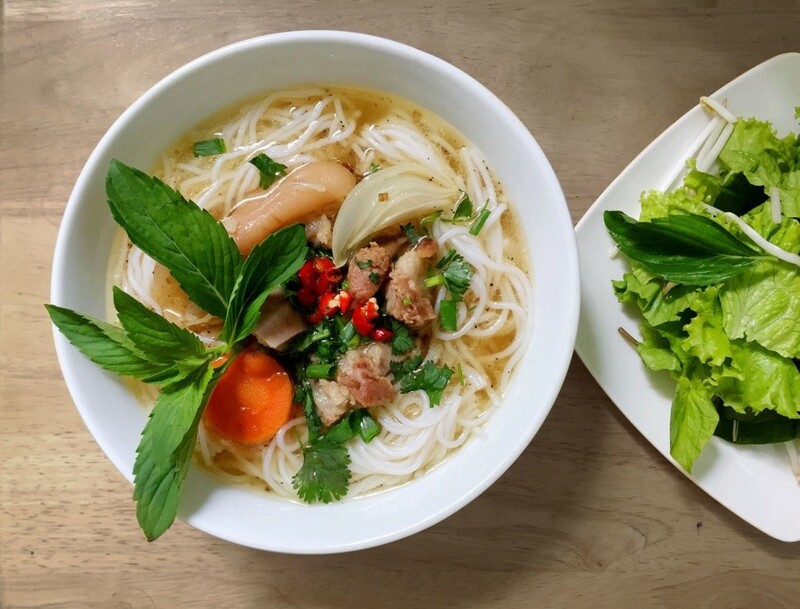 Pho, pronounced “fe” is a delicious noodle soup made with rice noodles, fresh vegetables, herbs and traditionally served with beef, although chicken and vegetarian variations are available. Steaming hot bowls of pho can be found all over the country at the smallest places. Arepas, a flatbread made from maize flour, are a staple food in both Colombia and Venezuela. In Colombia, they are usually topped with butter, cheese, eggs or chorizo and are commonly eaten for breakfast or as an afternoon snack, though you can buy them from street stalls all day long. Another Vietnamese street food staple, Banh Mi is a wonderful legacy of the country’s multicultural history. The sandwich of crusty bread which owes itself to the countries former colonists, the French, and packed with fresh Vietnamese herbs and flavours, banh mi can be filled with a range of fillings, most commonly egg or pork. 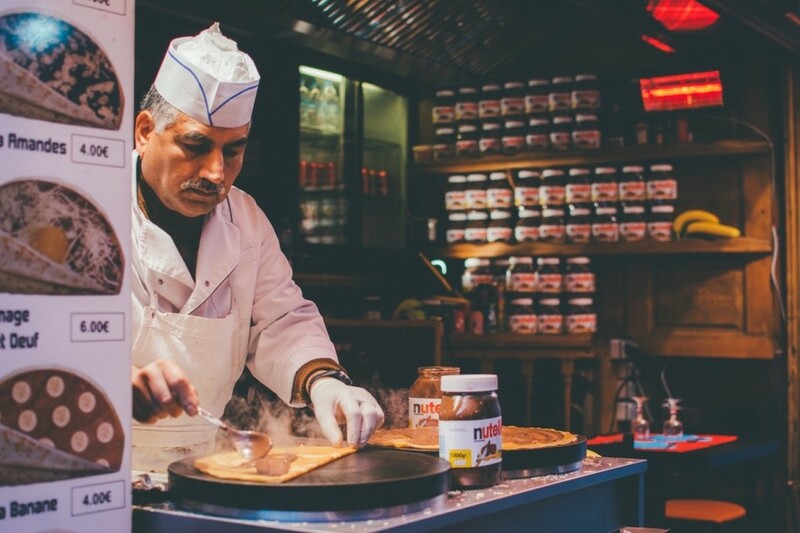 Even if you are just passing through the city on your way to another French or European destination, securely store your luggage in Paris, and hit the streets to find delicious crepes. Street crepe sellers can be found all over the City of Light, even in the icy depths of winter, cooking fresh crepes on big flat cooking plates. They often have a variety of toppings available, but stick to tradition with Nutella or Nutella and Banana. Tacos can be found all over Mexico, and tacos al pastor are one of Mexico City’s specialities of Mexico City. Containing grilled pork marinated in dried chiles and spices and encased in a soft wheat tortilla, these tacos are a fusion of Mexican and Lebanese cuisines thanks to influences from Lebanese immigrants to the American country. Nasi is the local word for rice, and nasi goreng is a globally-renowned Indonesian dish of spicy fried rice containing garlic, shallot, egg and sometimes a small amount of sausage, chicken or shrimp. It is available throughout the country and great for a snack or a full meal. Choripán is a local favourite through most parts of South America, including Argentina, Chile, Uruguay, Brazil, Peru, Bolivia and Venezuela where you can find them at street stalls. These can vary from country to country but are essentially sausage sandwiches. In Argentina, they are always a beef and pork sausage grilled and served with crusty bread and topped with chimichurri sauce. The Dutch certainly love their deep fried potatoes! Fries (or chips to the British) can be found at small snack bars all over the country with a dizzying array of toppings and combinations, including but not limited to mayonnaise, “curry” sauce, sweet chilli sauce, raw onions, and combinations of multiple toppings. A popular local snack and a must try while you are in Hong Kong, these distinctive bumpy waffles are cooked using special metal plates over a flame, or in some cases using an electric heater. They are made from an egg-y batter and usually served plain, though can sometimes be found in different flavours or with a fruit or chocolate topping. Dürüm is a wrap of flatbread filled with döner kebab (spiced meat) on the inside. The meat is usually lamb, but can also be chicken or a combination of beef and veal. These have been exported to the world, known by many names in different countries and are popular with late-night revellers from Munich to Sydney, but head to Turkey for the original, authentic version. 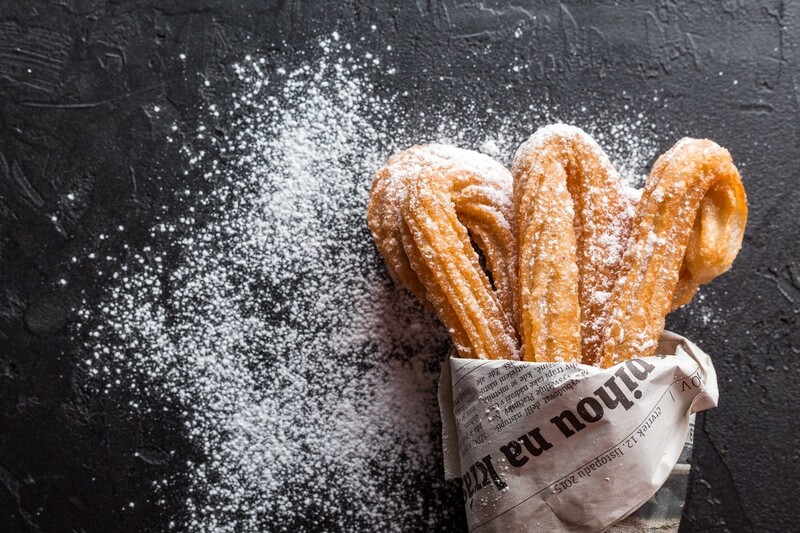 Often described as a Spanish doughnut but is so much more than that. Batter is piped in a star shape and deep fried so they are crispy on the outside and soft and fluffy on the inside and are served with a rich chocolate dipping sauce. This Berber stew is a traditional dish in North Africa which is slow cooked over coals in an earthenware pot by the same name. Tajine can be made from lamb, chicken or beef, with vegetables, herbs and spices and often also containing fruit and nuts. You can find tajine served with couscous or bread in street stalls throughout Morocco. This classic Cajun dish is named after the cooking process, which involves “jerking” or poking the meat as it cooks to get the maximum flavour. Spicy and sweet and served with rice and peas on the side, head to any “jerk hut” on the island for this fabulous grilled dish. Bao is a soft, fluffy white bun filled with something savoury, such as vegetables or meat. Sometimes called “little eats” locally, the sweet bun deliciously offsets the savoury filling. The origin of falafel is hotly contested, with Egypt, Palestine and Israel among others claiming provenance. Made chickpeas and deep fried, it is a particularly important part of Israeli cuisine. Grab falafel at a street stall in Tel Aviv, served in pita bread and topped with salad, pickled vegetables, hot sauce, spices and tahini. 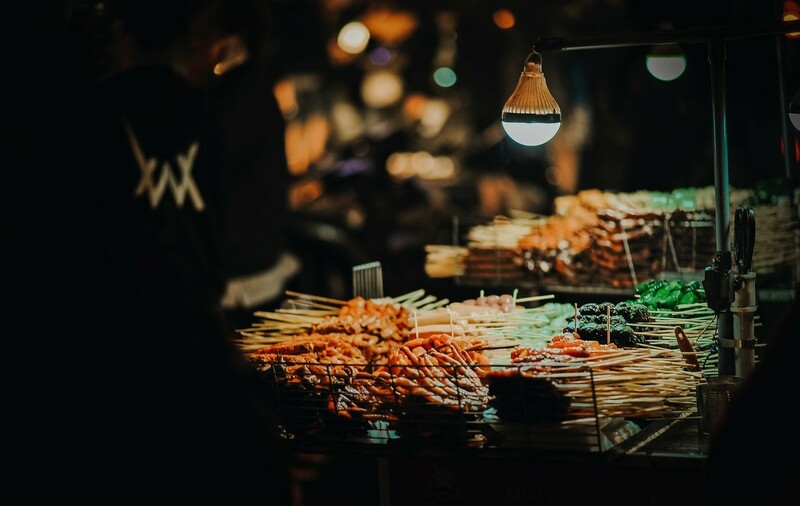 Singapore is possibly the world capital of street food, and Hokkien mee is probably their most classic street food dish. It is made from a combination of rice and egg noodles, stir-fried with pork, egg, shrimp, squid and bean sprouts in a garlic and soy sauce. 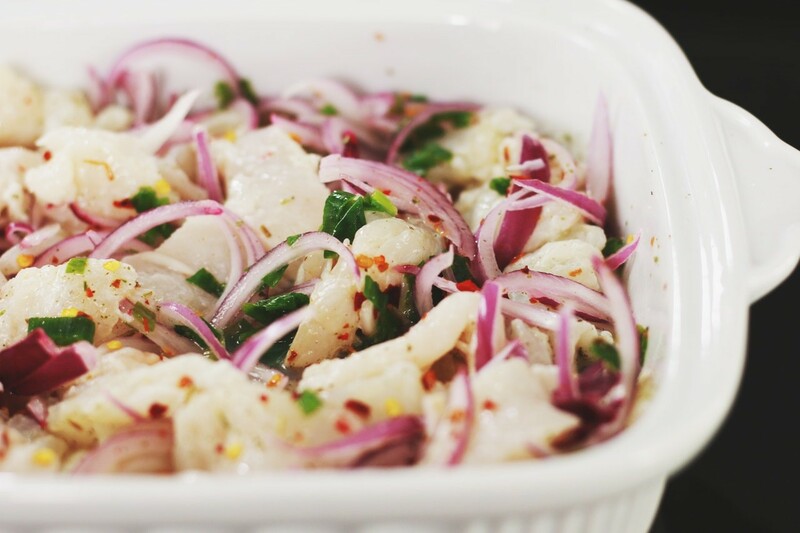 Ceviche is popular throughout many parts of South and Central America, ceviche is legendary in Peru. The dish consists of white fish cooked in citrus juice (usually lime), spiced with chilli and served with fresh salsa and fried tortilla chips for a perfect mix of soft and crunchy. A speciality of Mumbai, bhel puri is a mix of puffed rice, fried sev (thin noodles similar to vermicelli), vegetables, spices and chutneys. Grab some sweet, salty and spicy bhel puri at any street stall in the city and particularly at local beaches.